The big stars were Victor Terra, Linkie Wilson, Casey Kucharyk, Stefano Ciaraldi, Sammy Ioannidis, Ian Harrison, a young Eddy Ellwood, Pete Moen and many more top names. See all the Amateur Mr. Universe action at the Men’s Show from all the posing routines of the top 6 in each class to the awards and overall posedown won by Victor Terra of USA. 1988 was a classic year and an outstanding year for USA in particular. The big stars were Victor Terra, Linkie Wilson, Casey Kucharyk, Stefano Ciaraldi, Sammy Ioannidis, Ian Harrison, a young Eddy Ellwood, Pete Moen and many more top names. 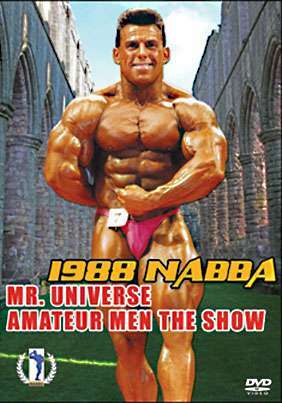 See all the Amateur Mr. Universe action at the Men’s Show from all the posing routines of the top 6 in each class to the awards and overall posedown won by Victor Terra of USA. 1988 was a classic year and an outstanding year for USA in particular, see the RESULTS below.